Another winter sport enjoyed by many in northern Michigan is snowshoeing! It’s easy to slip on a pair of snowshoes and enjoy the beautiful trails in and around Traverse City. You can snowshoe just about anywhere that there is snow! Some of the more popular snowshoe trails in the area include Grand Traverse County Natural Education Reserve, the Grand Traverse Commons Natural Area, and the Old Mission Lighthouse Park. While a little further out of town, you can also find beautiful trails at Grass River Natural Area in Bellaire and Sleeping Bear Dunes National Lakeshore. There are a number of snowshoe races, events and guided hikes that you can also take part in. The Bigfoot 5K & 10K Snowshoe Race takes place this weekend (January 20, 2018) if you’re looking for a more competitive event! 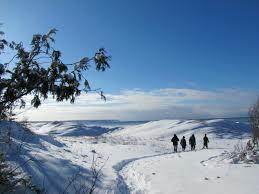 Sleeping Bear Dunes is also offering free, ranger-led snowshoe hikes every Saturday at 1 p.m. through March 17. If you want to combine your snowshoe hike with a little wine tasting, there are also plenty of opportunities for that! Black Star Farms invites you to Snowshoes, Vines & Wines! at their Suttons Bay vineyard every Saturday. You can also tour several wineries with the Snowshoe Wine & Brew on Old Mission Peninsula (every Sunday through March 4) or the Vine to Wine Snowshoe Tour on the Leelanau Peninsula Wine Trail (January 27 & February 17). If you don’t have your own pair of snowshoes, it’s easy to rent a pair. Many of the events listed above offer snowshoe rentals, but you can also rent a pair at any time from Suttons Bay Bikes for $18/day or from Brick Wheels for $15/day (or $75 for the whole week).